"On Wednesday, July 8, the monks of Quang Minh Temple will do their annual pilgrimage to Uptown area Buddhist temples. They will start at their temple (on Damen just north of Montrose) and walk to Chua Truc Lam at Ashland and Wilson. 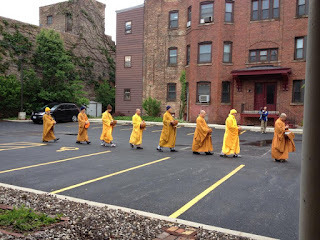 Then they will visit the Buddhist Temple of Chicago (corner of Leland and Racine) and Wat Phrasri-ratana-mahadhatu (Racine just north of Leland) and complete the pilgrimage in the Argyle Street area. Weather permitting, no exact schedule but tends to proceed in the late morning to past noon." The pilgrimage is based on an ancient Buddhist tradition of visiting neighboring temples and anyone is welcome to watch them pay their respects. Here are some photos from previous years' processions. They were accepting things from people. Monetary donations or prayer requests? Anyone? I didn't want to offer anything and cause insult. In previous years, Rev. Patti has said that donations are welcome. I imagine monetary, but I'm not sure.